In Polynesian mythology, Pele is the fire goddess of Hawaii. A powerful and destructive deity, she is said to live in the crater of the volcano of Kilauea on the big island of Hawaii. Perhaps the best-known deity of Hawaii, Pele appears in many myths and legends. 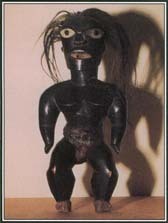 Like many figures in Polynesian mythology, Pele is a great traveler. She came to Hawaii from the island of Tahiti, but the reasons for her trip vary. Some myths say that she fled Tahiti to escape the anger of her older sister, whose husband she had stolen. In other stories, she was driven from Tahiti by a great flood or went to Hawaii simply because she wished to travel. Pele's arrival in the Hawaiian Islands was accompanied by mighty volcanic eruptions. She visited various islands looking for a place to live, but the sea constantly flooded the sites she chose for a home. She finally found refuge in the volcano of Kilauea. Once settled in Kilauea, Pele traveled to a neighboring island and fell in love with a young chief named Lohiau. After returning home, Pele sent her young sister Hi'iaka to fetch the chief. She gave Hi'iaka supernatural powers, which the young woman used to overcome various obstacles during the journey. When Hi'iaka arrived at the home of Lohiau, she found that the young chief had died of a broken heart caused by his longing for Pele. Hi'iaka caught his spirit and used her magical powers to restore him to life. Meanwhile, Pele became impatient, imagining that her sister had stolen Lohiau's love. The enraged Pele sent a stream of lava that killed Hopoe, the dearest friend of Hi'iaka. When Hi'iaka finally brought the young chief to Kilauea, she learned of the death of Hopoe. Grief stricken, she embraced Lohiau, whom she had come to love. Pele saw this and sent more lava to kill Lohiau. Protected by her magical powers, Hi'iaka later restored Lohiau to life again and went to live with him on his home island. According to Polynesian stories, the powerful and destructive fire goddess Pele lives in the volcano of Kilauea on the island of Hawaii. Many other legends deal with Pele's fiery temper and reveal how unpredictable and dangerous she could be. In some myths, she also appears as a water goddess who caused the seas to encircle the islands of Hawaii. Both Pele and Hi'iaka are considered patrons of magic and sorcery as well as of the hula, the ancient sacred dance of Hawaii. See also Polynesian Mythology .